Have you ever thought about this? About the implications? Or about whether that’s even true? It seems self-evident that we all have an eternal yearning and that, therefore, something drives us to strive for an eternal existence. I started thinking about this in the throes of infertility as I sought to grapple with why it was so important to me to have children. And I finally realized that we see children as a legacy, a way to continue, a way to exist beyond this life–at least in some form. I would argue that all people make some attempt at eternity. The powerful do this by building monuments or statues to themselves. It’s as if they believe–perhaps subconciously–a bronze statue set up in the middle of the square will forever remind people of who they were. And the inteligentsia preserve themselves through great discoveries and inventions, or great works of art and literature. And for a time these things remind us of their creators. So we recognize and remember the names of Marie Curie and Vincent Van Gogh and Harper Lee and even Galileo or Socrates. 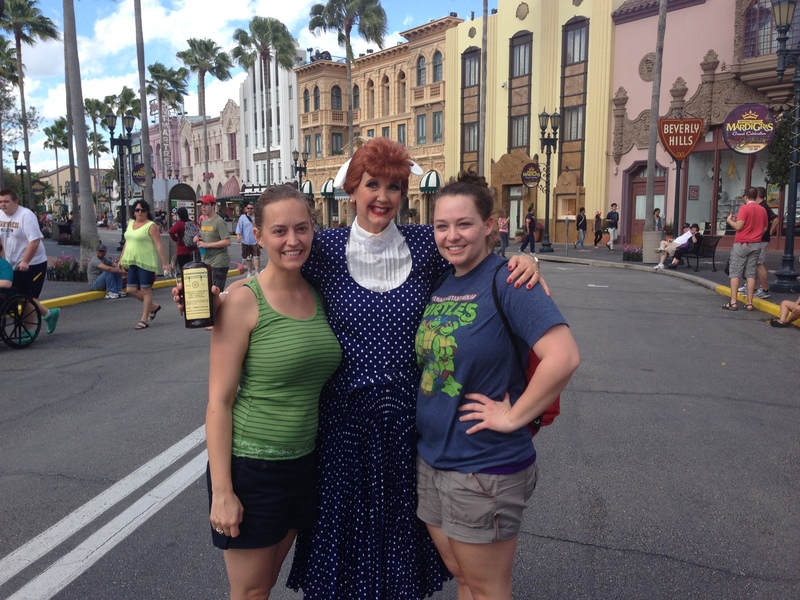 Lucille Ball lives on in our memories and even in people who dress up like her at Universal Studios, FL–at least for now. But there are many who have contributed to our understanding of the world and of beauty whose names are long forgotten: who wrote Beowulf? And who devised the alphabet? Or recognized addition? The great achievers are so often forgotten, and perhaps all will be forgotten in the end. And the regular folks among us–we strive to carry on through a name, through a child (and later a grandchild, a great grandchild, and so on). My father-in-law is an only son (he has two sisters), and my husband is his only son. When our son was born, DH’s grandmother remarked, joyfully, that the family name would continue one more generation. While this urge to bear children may not be a conscious attempt at extending our presence on earth, I believe at least subconciously, that is part of the motive. But sometimes, family lines end. A family has only girls (a strange phenomenon in our culture that girls don’t carry on names and lines–but that’s another topic entirely). Or a person never meets “the right person.” Or a marriage does not result in children for whatever reason. But either way, there’s this clear drive to go on in some form or fashion. I believe this drive for eternity we see exhibited in so many ways is present in us because people are eternal. People are created to live forever. If statues and inventions and even children don’t get us there–how do we live forever? We know we’re going to die. People die. But I believe we were made to live. To continue. Beyond the earthly realm, we hear about many ways to a sort of everlasting existence. The quest for eternity appears in many of the world’s religions. A Buddhist seeks nirvana–a sort of eternal bliss state and reuniting with the universe from what I understand. Hinduism teaches reincarnation–a continuing on of the same spirit of a person ad infinitim. Judaism professes an eternal existence that takes different forms depending on which interpretation one follows. And Islam and Christianity both preach heaven–although the path to heaven differs for each. The problem is, no one is perfect. We all yearn for eternity, but none could earn it. We all fall short. The Bible says, “For all have sinned and fall short of the glory of God” (Romans 3:23) Sinning, and falling short, means we put ourselves in opposition of a perfect God. And, “the wages of sin is death” (Romans 6:23). Great. So for even one sin we earn death. We are made for eternity, but we earn death the first time we fall short of God’s standard. And we don’t really have a way, in ourselves, to go back and undo even one bad deed. We earn death, and we can’t unearn it. But, God loves us. And God wants us to be with him in our eternity. The Bible says, the Lord “is patient with you, not wanting anyone to perish, but everyone to come to repentance” (2 Peter 3:9). Since we can’t live up to God’s standard, we can’t get to God. But God knew that, so he came to us. His Son took on flesh and lived a sinless life–something only God could do. He died a gruesome death on a cross and paid for all sins for all people. He paid the wage we have all earned. And he rose from the dead. This resurrection shows that God accepted the sacrifice made on our behalf and that Jesus defeated death once and for all. Jesus paid for all of the sins of all the world. But we have to choose if we want to accept that free gift. We have to be able to accept it, and recognize that we cannot earn it. Attempting to earn our way to God will fail every time. Statues fall down. Inventors get forgotten. Family lines die out. There is no way for us to make ourselves eternal on our own. But the Bible says, “For God so loved the world that he gave his one and only Son that whoever believes in him shall not perish but have eternal life” (John 3:16). Believing this truth is what is meant by having faith. And the Bible says, “For by grace you have been saved, through faith; and that not of yourselves, it is the gift of God, not as a result of works, so that no one may boast” (Ephesians 2:8-9). If we trust God, we have the everlasting life we are all wired to desire. And we can be assured of it, because it is based on something that God does for us and not something we are working toward or trying to do for ourselves. Jesus says, “Very truly I tell you, whoever hears my word and believes him who sent me [God the Father] has eternal life and will not be judged but has passed from death to life” (John 5:24). I urge you to notice the present tense here: believing in Jesus means you have eternal life. No need to work for it–which is good, because working for heaven would leave us falling short. One who believes the good news of Jesus Christ can be assured an everlasting life–thus resolving the urge and fulfilling the yearning ingrained in us because of our eternal nature. This doesn’t mean we don’t still seek to make a noticeable difference in this life, or to have children–but perhaps it can meet the heart’s need for life that continues, making the accomplishments and desires of this life less pressing. This truth is something I believe with all my heart and something I’d stake my earthly life on. It got me through the hardest parts of dealing with infertility and it will get me through this life with the ups and downs we are going to deal with. It’s the hope that I have. And it’s about time that I made that clear here. If you’ve read this and chosen to believe in what Jesus has done to grant you a life that does not end, I encourage you to talk to someone about your decision. If you want to talk to me about it, please let me know in the comments or send me an email at dwellsinme (at) gmail (dot) com. I would love to talk to you! By that same token, if you’ve read this and don’t know if you want to believe, or have some questions, or think I’m way off base here, and want to talk about it–well, shoot me an email. I’d love to talk to you, too! *I’m not an expert on Islam–or any world religions–but found this article helpful in understanding an Islamic view on salvation compared to the Christian perspective. Categories: And Faith, Finding Things to Be Thankful For, God's Will, Infertility, Our Baby, Scripture | Tags: Assurance, christ, christian, christianity, Death, eternal, everlasting, faith, Galileo, God, gospel, Harper Lee, hope, Jesus, life, salvation, sin, Statue, Van Gogh, World Religion | Permalink. I’ve been thinking about this a lot lately. How do I know if something that happens to me (or around me) is good or bad? Is it even possible to know the difference this side of heaven? Maybe this seems a pedantic question. Or even a semantic one. But I think there may be real spiritual implications in how we define this one little word. As with many words, we can be a little loose with our language sometimes. How often have you said something was amazing or awesome–even though you know that these words can truly, deeply, only apply to God? And what do you love? Do you love your spouse? Your shoes? That great movie? Clearly we don’t mean the same love for all things. So, I’ll start by refining what I’m talking about when I ask this question. I’m not talking about what tastes good, what looks good, what feels good–these are clearly things open to interpretation and different for each person. I can no more determine what tastes good for you than you can for me. It is a matter of personal preference. I’m also not talking about clear, defined standards set forth in scripture. I don’t need to debate whether God is good–in the most complete and intrinsic sense of the word. And I don’t need to debate whether no one else is good. Jesus said as much. (See Luke 18:19, “‘Why do you call me good?’ Jesus answered. ‘No one is good–except God alone. '”) Similarly, I’m not asking if creation was good or bad–as God declared all things good when he made them. That was before the fall. I’m talking about how we evaluate the things around us. How do we view our life circumstances? Do we view them all on the basis of personal preference–if it feels good (or bad), it must be good (or bad)? Or do we view life circumstances and the trials and challenges and sufferings in light of scripture? Maybe infertility isn’t intrinsically good. But maybe it’s been good for me. If I am living in light of eternity, and living as a sojourner and alien in this world, then what is good and what is bad is going to take on a new meaning. What causes pain or suffering or temporary discontent in this life may be bringing me closer to God. What I see as “bad” and what causes suffering may be integral to developing my relationship with God. And does that not make such events–or at least the repercussions of such events–good? The world is full of evil, don’t misunderstand me. And the devil will play his games and work his tricks to try to pull us down. But I would submit that if we are living life in view of eternity, we won’t be fooled by the devil’s schemes. We can’t be brought down into the pit of despair when we know that God is truly for us (Romans 8:31). Bad things happen. I’m not saying that bad things are good. But if we believe, if we trust God in everything, if we do not fear the world because we aren’t of this world–even the worst things can be used for good in our lives. And so I ask again–can we define what is good? Because I don’t think I can trust my instincts. I think knowing what is good for us and what is bad for us is impossible this side of heaven. And what are the spiritual implications of not being confident in our definitions here? There is one who knows. One who knows that the difficult childhood you went through directly relates to your acceptance of the Son. One who knows that the wealth and prosperity you received in this earth did nothing but distance you from himself. One who knows how to bless us–even when that blessing includes a baptism by fire and trial and pain–so that we will truly know him. And since he knows and I don’t, I must choose to trust him and trust his direction for my life–even when it goes against my hopes or plans or sense of what is good. All the “good” things this world can offer us are really bad if they pull us away from God. All the “bad” things in the world that push us on our knees and draw us to God and Christ are a gift to us. When I’m with God, if I have any care whatsoever about this life I’m living now, I’ll not be surprised to hear him say, “That trial of infertility? I allowed that in your life. I did it because I love you, and because I knew it would draw your heart closer to mine.” And what response can there be to that but a heartfelt thank you? So I give up on trying to value my circumstances. And I say, why not thank him now? Categories: And Faith, Finding Things to Be Thankful For, Infertility | Tags: bad things, closer to God, consider it joy, intrinsic good, James 1:2-4, Jesus, pain, persecutions, Philippians 3:7-11, prayer, Romans 8:28, salvation, suffering, surpassing worth, trial, trials, trust God, what is good | Permalink. This post is sort of a part two to my previous post. If the last post was confusing or muddled, this one may be worse. Apologies if that’s the case. I am embarrassed to say that I often think that my sins aren’t so bad. I mean, I know (head knowledge) that “all have sinned and fall short of the glory of God” (Romans 3:23) but I’ve been lacking any conviction of that (gut faith). I was feeling moved, so I pulled out my old Greek reference books (I’m a total geek, in case that wasn’t already evident!). The word used for glory is δόξη (transliterated: doxa). And my Greek word study dictionary had about 5 pages of definitions and explanation of the word. A lot of the definitions were tied to specific verses. I found it fascinating. It had a special part about Romans 3:23. My book said that when Paul writes “fall short of the glory of God,” it means that we don’t live up to what God has intended for our lives, that we don’t line up with the image and character of God. For some reason, that got through to me. I may not have murdered anyone or cheated on anyone, but I do know that I have not lived up to what God intended for me. I know that I don’t align perfectly with the image and character of God. And because of that, no matter the nature of my sins, I needed a savior just as desperately as all those people who may or may not have done really bad things by our worldly definition. And if I can see how desperately I needed salvation, how truly short of God’s glory I fall, then I can have such gratitude for what God has done for me. And I think that gratitude is where joy begins. I can be joyful because I know what a great thing God has done for me. That gift of forgiveness–of making up for my shortcomings–outweighs the temporal pain of barrenness. It doesn’t mean I don’t feel that pain or that I don’t suffer now, just that the joy should remain throughout. I haven’t quite gotten there yet. Still working. But as long as I am still wrestling with these things, I think I am moving forward. Categories: And Faith, Finding Things to Be Thankful For, Infertility | Tags: doxa, fall short of the glory of God, glory, Greek, gut faith, head knowledge, Hebrews, joy, Pharisee, Romans 3:23, salvation, sin, value, word study | Permalink.